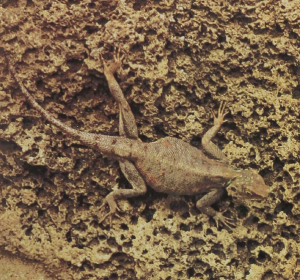 Agamids are the Old World equivalents of the iguanids of the New World. 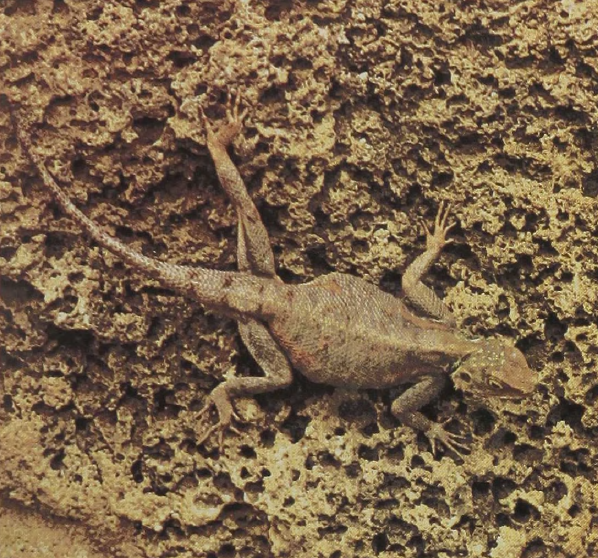 The Common Agama ranges far across the African continent. The genus has 60 species, some of which range through Asia; a few species grow to be 18 inches long, but the average size is about 12 inches. The Common Agamas are the ubiquitous diurnal lizards of Africa, and one sees them on tree trunks, rock faces, fences, and the walls of houses. The head is yellow or orange, particularly in adult males. The body is brownish to bluish black, the color varying between local populations. Agamas are highly territorial. The males interact regularly, displaying to each other from elevated perches bobbing up and down and, in some cases, inflating or erecting the throat fan. Most species feed on insects, though the larger individuals of some forms take flowers and leaves.